Exam was held on 1st July, 2012. Approximately 20000 candidates appeared in the exam. The low attendance of candidates was due to the fact that BEL Entrance exam was also held on the same day. Exam was held in 10 cities viz. Ahmedabad, Allahabad, Chennai, Delhi, Guwahati, Hyderabad, Kolkata, Mumbai, Nagpur and Thiruvananthapuram. Result was declared on 7th August, 2012. Total 561 candidates were shortlisted for the interview and voice test. Interviews and Voice test were conducted in August, 2012 in four metro cities viz. Delhi, Mumbai, Chennai and Kolkata. Final result was declared on 22nd October, 2012. 200 candidates were selected for the post but around 160 candidates joined the training institutes of AAI on 5th November, 2012. AAI released second list for 41 candidates in January, 2013. Before going for cut-off marks discussion, let’s just understand two important things i.e. how the marks are divided by AAI and what do we mean by the term “cut-off marks”. Exam was conducted on 26th April, 2015. 200 candidates were selected through the selection process which comprises of Written Test and Voice Test + Interview. This was the last time when AAI conducted the exam through Offline mode. Also this was the first exam in which B.Sc. candidates were also allowed to appear in the exam. Technical Section of Written Test had questions only from Maths and Physics. This time AAI also published Answer keys as well to bring the transparency in the selection process. Result of written test was declared on 6th August, 2015. Total 599 Candidates were called for Interview and Voice Test. This time also there were two lists of selected candidates as all the candidates of first list did not join AAI’s training institute. Exam was conducted on 26th December, 2015. Total 400 candidates are to be selected through this exam. This was the first time when AAI conducted the written exam through Online Mode. Total 1034 candidates were shortlisted for the interview and voice test. Based on the level of questions in both sessions i.e.Morning and Evening, I have tried to make wild-guess about the expected cut-off marks that should be sufficient to get you an interview call from AAI. Please do remember here that above data is just expected one, for actual cut-off marks of JE-ATC Exam held on 26th December, 2015, we need to wait for the result declaration by AAI. 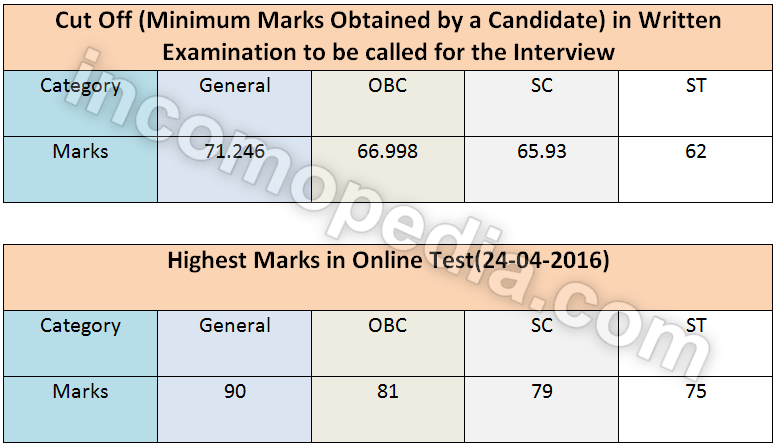 I will upload the category-wise cut-off marks, once result is declared. An RTI is to be filed soon for the same so that all I upload on ‘incomopedia’ is the authentic data. Edit/2: Some of you might be having a doubt that if there is no negative-marking and each question carries one mark, then how come the cut-off marks are in decimals? Well, these marks are basically the normalized marks and not the actual marks secured by the candidates. That is why this decimal figure has come into the picture. The description of normalization process is beyond the scope of this article. Edit/3: AAI has given a link to check the normalised marks of the candidates who appeared in the JE-ATC Exam conducted on 26 Dec. 2015. You need to enter your Application Number & Date of Birth. Check your marks by clicking here. AAI doubled the number of vacancies for the post of JE (ATC) i.e. 400 posts instead of 200. Test was conducted online and Exam was much tougher than the JE-ATC exams held in 2015. Result was declared in February, 2017. 200 candidates are to be selected. Most of the students found the online test more difficult than all previous year’s exams. It is the first time AAI is recruiting JE candidates without the Interview process. Result was declared on 01 February 2019. 536 candidates were called up for document verification process. Hope the article will be able to present a picture of trend of the cut-off marks of ATC Exam. When the result of JE ATC held on 26/12/2015 will come any idea? By April End most probably. All the information regarding exam preparation is uploaded on this blog. Please take some pain and read the related posts already available. For 2nd phase interview of AAI_ATC-03/2015, I am shortlisted…but my marks after increment are 72…is there any chance to select in final merit list? approx how many marks i hv to get in interview…give me some ideas. ..
Why there is need of extra 1200 candidates to call for interview in second phase…. 1. i have already done with my interview in the first phase on 11th march 2016..and now after the revised answer key, my marks got incremented by 2. will the incremented marks be added to my overall marks now..? 2. i have read in some news articles that there is a shortage of atc officers in aai…and the chairman has announced that aai is going to recruit many atc officers in the coming days….in this context,anyhow as they are going to interview 1200 more candidates now in the second phase, are there any chances for aai to increase the number of posts to be filled..? Hi! Can we expect a delay in the exam for advt 07/2015 given the present scenario of 2nd phase interviews? Moreover, the list for 2nd phase interviews has 1231 people. Will there be any seats left for the conduct of the exam of advt 07/2015?? Is there any chance it may be cancelled? Hello sir, I gave interview for JE (Electronics) at January 2016 but now they announced second list for interview. Can you tell me the expected time after which they will announce the final result. Expect after one month of completion of interviews. If selected when will be the joining date in AAI for advt 07/2015? There is no such blue print or schedule as you are asking. After exam expect 5-6 months. 2nd phase interview list is is cancelled and mailed us fresh dates will be intimated separately…is there any chance of new merit list…I was already selected in 2nd phase of interview list. Yes…new merit list will be prepared. It is cancelled for time being not permanently. cut off will not reduce. Do u have any idea on what basis 2nd phase list of 1231 candidate was declared for ATC 03/2015? ?Also will they keep all the 1231 candidates in the new merit list? ?Any idea when will the new list come?? 1. As list is cancelled so it doesn’t matter what was the basis. 2. Not all 1231 will be called. Thanks…pls share with us the cutoff analysis for the 2nd phase list.It wld be much helpful for us. Cut off is expected to be higher by 1-2 marks. Why last time? AAI is not going to shut down buddy. When will be the results for the written exam (junior executive ATC) held on 24th april 2016 be published?? I have written atc(adv.07/2015)…. when can I expect its result???? Hello sir, i did my xam for the post of junior xecutive in aai at 24th apri 2016l.wen i get the result sir.nd how i know that the results are released.am i get it in my mail id itself or through the website only. result is expected by June. You need to check AAI or Incomopedia (hehe) website for that. chances are always there…keep fingers crossed. What will be the cutoff for st for atc je 26th dec 2015 exam ? for 26th Dec Exam, cut off marks are available on incomopedia. Just check the related post. i had done btech in CSE , i applied for both JE (iT) and JE ( airport operation) . Is exam of IT and Airport operation will held on different dates or on same date . How can I predict this? The general trend is no clash of exam dates. For JE (atc) on 24th april 2016 shift 2, i got 73 in UR , what are my chances of interview in 1st phase and 2nd phase . There are lot mistakes in answer key of shift2 exam , if AAI consider that mistakes then my new marks will be count in 1st phase interview or in 2nd phase ? There is no second phase of interview (omit last recruitment which got some issues). i want to know why is der a second phase list out for the voice test and interview and y is the number of candidates shortlisted been increased to 1800? Hehe…AAI can tell the exact reason. Second phase is being conducted bcz first phase interview was done on the basis of wrong evaluation of answer sheets. If the second list is there under 03/2015 then what about the candidates interviewed in the first list? They will also be considered for final list of selected candidates. i have been called for interview by 2nd list of candidates …where i got 71.278 marks ..so how damn good i do my interview .. i dont get 30/30 so i cant touch 100/150 marks to be in merit list …. 1) so pls tell me is ther any chance for me to be in merit list ..how much minimum marks should i get out of 30 in interview ?? Instead of making such stupid calculations you must prepare for your interview. Not that every one gets a second chance just like you guys. All the best. Prepare your level best. These speculations are ridiculous and wastage of time. I have been trying to check my marks for so long..Bt the site is showing that the time got expired..So is it possible to check my aai atc marks by any other means?? Not possible now as AAI has deactivated the link. Wait for result declaration now. Okay…have u appeared for interview? If yes then please share the questions. It will be of great help for others and incomopedia. They can ask anything. Some guys were asked only tech, some were asked about aviation, GK etc. So prepare all you can do. Waiting for the same from AAI. Plz suggest some book for technical if quuestion comes from E&C. It should be from IT and CSE only. Earlier ATC exam used be like what you are talking about. exact formula is known to AAI only. It depends on number of candidates appeared, number of vacancies in a particular category, highest marks etc. Sir I have been called for the ATC (JE) interview on 13th June. In documents list they told to bring “Consolidate Semester-wise/Final Mark Sheet of Degree Examination”. I have Degree certificate and 8th semester mark sheet (of B.Tech degree) on which my final CGPA is mentioned. is it enough?? Secondly, they asked for the “CGPA to percentage formula issued by the university”. is it necessary? Take all docs with you…there is no harm in that. Conversion formula is required to know your equivalent percentage. Please share your interview experience and all the best dear. When will aai announce this 26 dec interview results ? 1. what will be the career growth of JE(electronics) and salary level ? 2. is it same as JE(atc) ? 1. it depends on number of vacancies at higher level although there are certain designations where promotion is time bound. basic salary of all executives is same according to their designation. 2. salary of atc is higher owing to higher rating allowances. Both are held on the same day. Don’t book room. My reporting time of the interview is 01:00 pm on 03/06/2016. By what will the process of the voice test and the interview be over ? I’ve already booked tickets for a train leaving at 08:00 pm .Should I cancel the tickets or not ? I have got 57 marks in st category. My interview 6-6-2016 . 1. kya muje interview ke liye pedna chahiye? 2. My English communication is so weak. What to do ? AAI has given you a chance and you are very lucky bcz so many guys who were preparing for this exam could not get interview call. So just utilize this opportunity and do your best. Good luck. You need mark sheet of eighth semester which has marks of all semester so that AAI can check your overall percentage. Go with that. july end i am expecting. We are not chatting here. So write full question whenever you are asking anything. There are so many queries I handle so impossible to keep track of each and every question. sir , my interview was on 3rd june , 2016 .
i was totally prepared for the interview , but during the interview they only asked me about myself , certain questions regarding the use of my strength in ATC , my favorite subject and a question related to that . AND NOTHING MORE , after these few questions they told me that my interview was over, which lasted for about 10 mins . they did not asked even a single question regarding atc or my subjects . but at the time of interview they were quite satisfied with my answers . but i didn’t find any reasons , why they didn’t asked me any question , even when i was prompt and brief with my answers for the above question and was satisfying them with my answers . can you please tell me the probable reason why they did so ?? You have done your part very well and keep the fingers crossed for results. Don’t worry about interview now as it is already over and we can’t change anything. Good luck !! You have great in interview. English is not compulsory in interview although it is preferable so no need to worry. All the best for your results and please share your interview experience and questions with us. It would be great of you. Thank you so much Smita for taking so much pain and efforts to share your experience. Really appreciate that and Incomopedia wishes you best of luck for your final result. Please visit interview experience page on incomopedia and more questions from Smita will be uploaded by tomorrow. Stay tuned. Cut off is same. No change. Although I am not bound to give you any information vague or exact but I will say that it is due to wrong evaluation of answer sheets initially. They evaluated again properly and had to prepare list for second phase with the same cut off marks (as scored by the last candidate who appeared in first phase). And yes, Hopefully you wont use such language again on my blog. Hii , I had my interview on 7th June, B-2 , afternoon shift, 63 marks in written n st category. As I can see you have a very good interview and they don’t expect you to know all the answers. So keep the fingers crossed and all the best for your result. And yes, thanks a lot for sharing your experience with us. how can i get marks of atc and answer key of exam date 24th april. No means to check it now. Next recruitment can be expected by mid of next year. sir …I got 72 and am obc category ..my interview was on 30th may …interviewers asked me physics base question …I have done m.sc in physics (as electronics special ) ..my interview performance is about moderate …so what about my chance to select for training ?? ATC 26 the DEC interview cut off kitna hain ??? ?is there any waiting list ..for ATC ? Right now not available with us. You can file an RTI to know. No such waiting list published by AAI but expect second list in August or Sept.
sir, I am selected for the training as JE ATC. When will the training start? Will they send the offer letter by mail? By last week of July. Yes by mail. N congratulations dear. sir and friends please share your total marks or interview marks or written marks of ATC 26 th December ….who got call for ATC training ..
sir how can I RTI to check my interview +written marks of ATC DEC ..2015 …?? Through MoCA website. Link is there. very very high chances. 80 for SC is very good score. Taking into consideration as the huge number of candidates have taken the exam,what are my chances? Further, whether marks are increased or decreased after normalisation? Marks are decreased after normalisation. 87 is pretty good score to expect call for Voice test. All the very best. I have got 92 marks in 2nd shift ATC (obc). what are my chances to make it to the FINAL merit list after normalisation?? 92 is decent score. We are expecting cut of to be around 85. So you have good chances to make it to the Final merit list. Don’t know. People in a whatsapp group are expecting it to be around 85 for AO. Sir, I am getting 84 in General category in Shift 1. What are my chances of clearing cut off? We are expecting cut of to be around 85. So you have good chances to make it to the selection list. What will be the ratio of candidates called for voice test and is 85 marks safe for general category. For 200 post, maximum 250 candidates are expected as hardly any candidate gets failed in Voice test. 85 is safe if things go as expected. when can we expect results to be declared….any rough idea?? and the reason why last recruitment took such a long time?? Results are expected by Feb as first batch for training is expected to commence from June’19. It is general practice that recruitment is done once a year so we can’t say recruitment was done after a long time. can i see increase in marks for shift 1 ? i am getting 78 obc shift 1. Increase of marks is not a likely event. Best of luck. Sir I have 73 marks in ATC exam shift 2 sc category.Any chance of final selection??? 73 for SC is good enough to expect a call. I got 79(gen) in this year’s ATC exam.. is there any chance that i would make it to the voice test? You are in middle of both. 73 SC 3rd shift atc chances ? Sir, what is the expected date for the declaration of result of recruitment advt. 2/2018? Sir is it possible that atc’s result will be announced sooner than ao? Sir,I scored 83/120 in the 1st shift and Gen Category. Or you have any idea about max student in sc cat. Got more than 70 number. Sir 74 obc shift 1,any chance? ?is there any chance to increase the mark after normalisation? Any chance of getting a 2nd list. If so any chance for me with 77 marks in 1st shift in Gen category to make it to 2nd list? Sir is there any possibility for atc recruitment in 2019. Sir I am getting 87 marks , my name was there in document verification list but didn’t got selected, is there any chance for me in second list? I really don’t think there will be a second list.